So… The Legal Genealogist has been talking about deeds this week. Not all deeds of trust are mortgages. As reader Mary Douglass reminded me yesterday, sometimes a deed of trust is… a deed that establishes a trust. Period. Like the mortgage variety deed of trust, this deed of trust is also a three-party transaction: there’s always going to be a grantor (the seller or giver of the property); there’s always going to be a trustee (the middle man in the deal, the one who actually has the title to the property, but only as trustee); and there’s always going to be a beneficiary. It’s that last category — the beneficiary — that really is the focus when the deed of trust is really a deed establishing a trust rather than a mortgage. In the mortgage situation, the beneficiary is the lender. In the trust-establishing deed, the beneficiary is almost always some individual that the seller or giver of the property is trying to protect. Not a mortgage in this case but a real trusteeship: set up by her brother to benefit Judy Lanier without letting her husband get his hands on the land. So… in most cases a deed of trust is a mortgage. 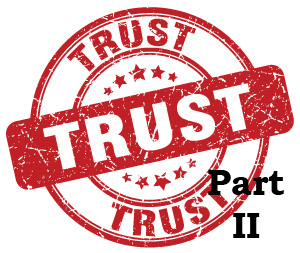 In every deed of trust there will be three parties. But in the mortgage type, the beneficiary is the lender who wants to make sure that he gets paid and the condition is that the debt is paid. And in the trusteeship type, the beneficiary is some individual who’s benefited by the deal but who, for some reason, can’t be given (or can’t be trusted with) outright ownership. And yes, deeds can be for any property, not just land. So you’ll see deeds, especially deeds of trust, during the slave era where the “property” involved was slaves, making those important documents for descendants of slaves and slaveowners alike. Sometimes it’s the exceptional deed that tells the tale. Judy, thank you, this helps a lot where a person was acting as Trustee in land transactions for two minors. At the time it may not have been known whether a parent was still living; no relative is named in the documents. The grantor was unrelated and lived in a different County. I just finished transcribing a will & Deed from a 4th g grandmother which referred to a “Deed of Marriage Settlement”. This 1833 deed is called an “Indenture Tripartite”. Today I think you would call it a pre nuptial agreement. How common was this? A great deal more common than people think: the deed of trust was used by many a father in the years when married women didn’t control their property to protect a daughter when she married.